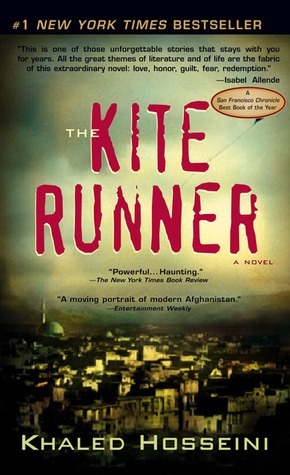 I put off reading Khaled Hosseini’s The Kite Runner for years because I thought it would be all about complicated politics and foreign policy. In the last year or so I have become more aware of and interested in politics, so I recently felt compelled to pick this one up, and I was surprised to find a heartrending human drama. Not perfect, but I was entertained and it made me think about different behaviors and relationships more than anything else. Amir, the narrator/protagonist, frustrated me with his cruelty and incessant cowardly weakness. Of course, sometimes you are not meant to like the main character, so this factor didn’t bother me. I do not believe Amir redeemed himself at the end of the book—I still had the impression he only went back to Afghanistan out of some sort of selfish, guilty obligation and not because he genuinely wanted “a way to be good again.” Hassan, Amir’s best friend and servant, was a beautiful, innocent character, if a bit one-dimensional. I would have loved insight into Hassan’s true thoughts and feelings, other than just seemingly pure, blind devotion to his employers. Amir’s father Baba was domineering, enigmatic, and sharp-tempered. I found his character fascinating, actually. His big speech to Amir about the biggest sin being theft—all other sins being a form of theft—really struck me, especially the irony of it after we learn a vital truth about Baba. More analysis of that irony would have been welcome, but it’s not even mentioned. Some of the parallelism and explanations were cumbersome and heavy-handed. However, despite these observations, I did enjoy the story—it was a quick read and hard to put down at times, with several lovely descriptions and lively action, especially during the kite competition scenes. I appreciated reading about Afghan culture and the story’s undercurrent of the torrid political atmosphere in that part of the world during the 1980s and 90s, though this being a fictional novel I don’t take it all too literally, as though I have a deeper understanding of what happened there because I read this book. Read a non-fiction historical or current affairs work for facts. This is about the complex relationship between two boys of different classes during a turbulent time, just happens to be set in Afghanistan in the late-twentieth century. I am interested in reading Hosseini’s second book, A Thousand Splendid Suns after having finished this one. Read from April 8 to 21, 2012. This entry was posted in books and tagged drama, fiction, friendship, history, politics, society by kristin @ my little heart melodies. Bookmark the permalink.